Planning your camping trip is the best thing, the worst thing, the most confusing thing AND the most necessary thing all at once! Don't forget by now the biggest decision should have already been made - you're going! The rest will all come together and we will help you to help you plan your trip. We have a page called our TAWK Featured Families and it is basically how others went about their travels, how they got started and ten questions, that we asked them to answer to help you, so please check out our Australian Road Trips page to see how others started out. When you start planning your camping trip, you'll have more questions than answers for a while. I have compiled the Camping Check List for you to have a look through and you even have the chance to add to it for all the things you have thought of so far! Travelling with children brings challenges and considerations that others do not have. 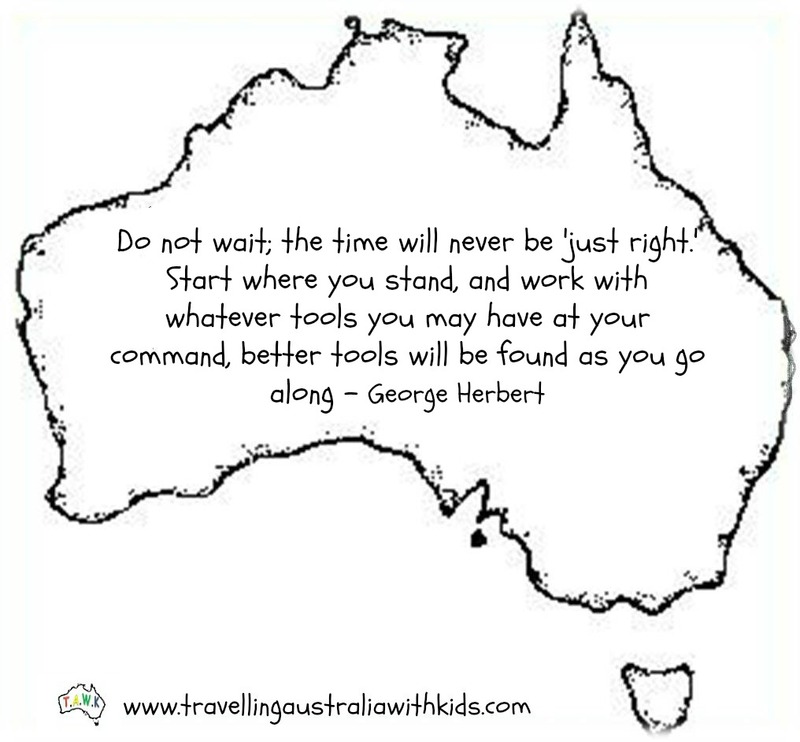 First - When is the best time to Travel Australia With your Kids? If you go before the children start school, this would eliminate the homeschooling issue, but would they remember anything? They can be really easy at this stage, but also quite demanding. How much trekking would you realistically be able to do? Primary aged children could seem like a good option as schooling is manageable and you do not have the worry of major exams. There is so much learning to be done just by travelling all the places that they would be learning about at this stage in their education. They still want to be with you! Teenager children could be a tricky age, as not only is the schooling more serious with exams but they will not feel like they want to be away from their friends at this time of their lives. This however could be the reason to do plan your camping trip at this time. Children that I knew of travelling at this age, fought it at first, but really embraced the freedom they found without the social media. I believe you should not let any thing stop you planning your camping trip. There will always be something if you look hard enough. So don't look!! JUST PLAN. Do not let this put you off travelling this wonderful country. There is a whole page on how to home school your children whilst you are travelling Australia on this site, because there are a few things that you do need to know. Just be inspired that there are so many resources out there for you and whilst you most likely are not a school teacher, with a bit of discipline and routine it will be one of the most rewarding things that you do do on the trip. Yes of course it has it's moments when either you or the children just cannot focus, and the good news is, you can leave it to tomorrow and go exploring, thereby educating in a different way for the day. Obviously it is a huge part of planning your camping trip, so for more information please visit the How to Home School your children page and Homeschooling Hints and Tips. Third - How are you going to do the trip? Space for one thing Space to pack all the things you need, space to be able to move in your living area and good sleeping space. So consider how much space you need. Simplicity is also a great commodity After a long day travelling, do you really want to spend the next hour setting up your home? Cost is usually one of the bigger factors How much do you want to spend on this 'home'? Do you need to buy new, or would previously loved be better. A full van is easier to set up than the more aerodynamic pop outs and ups. But the latter would be cheaper to tow. Major decision when Planning your Camping Trip: What will be your 'Home'? Probably the most popular choice - but then you have the question.. which type? There are so many different types to choose from - and by type, I mean full caravans, pop tops, pop outs etc. The most important thing to remember here, is your tow vehicle. 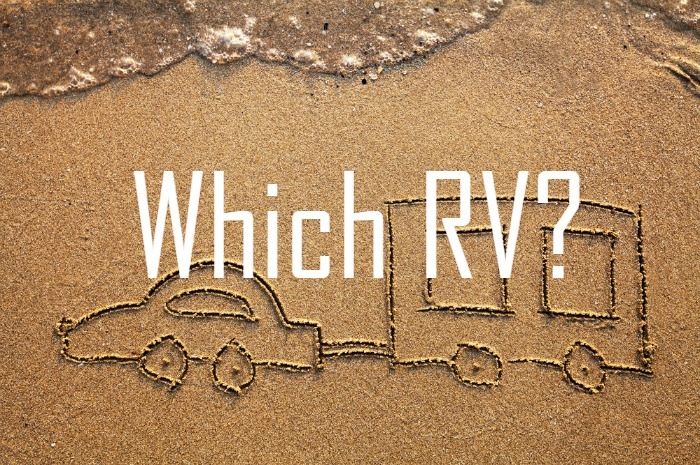 What will you be towing with? You must ensure that the caravan you buy is able to be safely and legally towed by the vehicle you drive. Click here for the different Types of Caravans in more detail. Taking a tent has a major advantage on space...but a huge disadvantage on space! We did not see many families taking this option, however we saw lots taking a Camper Trailer. In all honesty, give the camper trailer a serious consideration. You can pretty much take them anywhere. They are easy to tow and whilst the setting up does take a considerable time longer than a caravan - you get used to it and it does become second nature. 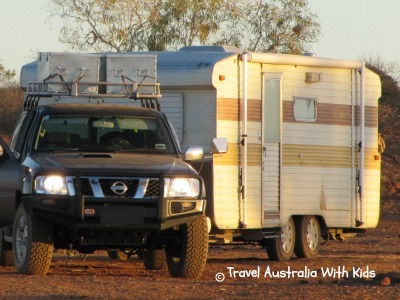 When planning your trip, if you are thinking about visiting some of Australia's more remote areas, but would like a 'kitchen' at least, then a camper trailer could be your answer. This is really all about safety. You must ensure that the vehicle you have is legally and safely able to tow the caravan! The main factor being the maximum load that your vehicle can tow, so you'll need to check the manufacturers handbook - but remember the load quoted is the caravan fully loaded and ready to go. There's no point in picking up the caravan running it over the weigh bridge, thinking you are good and then loading it with all your gear. You also need to bear in mind that when remote you will also more than likely be filling up the water tanks, which all add additional weight. The best thing to do is to speak to a towing equipment specialist, who will be able to give you the correct advice for your vehicle and caravan or camper trailer combination. Another huge thing to bear in mind is Tyre Choice. It's essential when planning your camping trip that you realise that you will be travelling huge distances and you need to choose really good tyres. There will be a probability that you will go off road, therefore you NEED good tyres. We saw so many families on the Gibb River Road for one example, changing their tyres. Some twice!!! So really put in the time and effort in choosing good tyres for the vehicle and caravan. Can we afford it? Mmmmm, will you ever be able to really afford it? Sometimes you just have to work with what you have. I would love to have got a new $90,000+ Bushtracker off road caravan, however, we had to go with a $6000 second hand, twenty year old van. BUT we did it! We went AND we went for two years. We had to work on the trip to bring in extra funds, but we did it. YOU CAN TOO! You should check out our Travel Budget Tips Page and think about getting a Travel Finance Tracker. 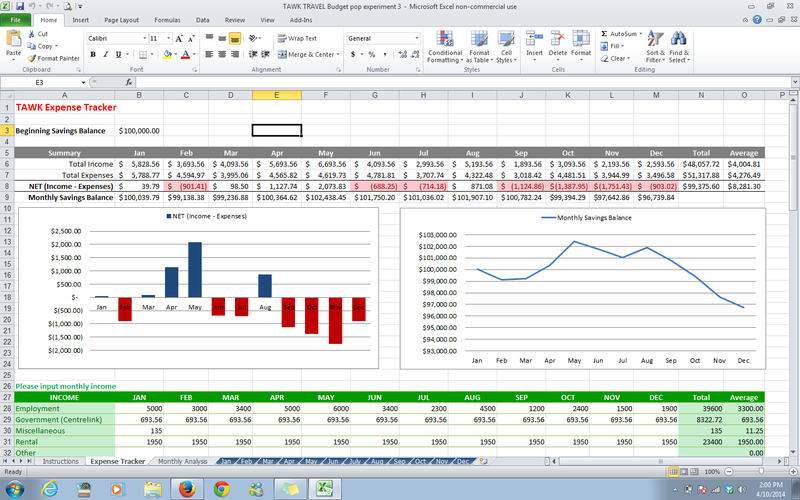 This certainly helped us to see where our money was going and where we stood. It is scary, it can be hard to believe that it is possible, but it is. The hardest part is making the decision, once made the rest will all fall into place and planning your camping trip will be sooooo exciting! Click here for the Full Story on how we chose our caravan and vehicle. This is another essential part of your planning your camping trip. Get yourselves on a First Aid course. You might be really remote and you never know when you need to administer first aid. From snake bites to being involved in an accident (let's hope not) being aware of first aid not only gives you peace of mind, but could really save a life! There is even a course on Remote Area First Aid. Please visit St John Ambulance Australia to book a course in your area. So now it's time you you to start planning YOUR Camping Trip!